As noted in an earlier post, Edward Tyldesley 1582-1622 left instructions in his will that he wished to be buried in the Tyldesley Chapel in the church at Leigh. Instead it appears that he was buried in the Priory Church at Cartmel. It is likely that this is because the Preston family had acquired Cartmel at some point around 1620. Edward Tyldesley 1582-1622 had married Elizabeth Preston in 1605, though it is clear from his will that the marriage was not a happy one. A.D. 1674.—Mem. "In pursueance of an order in the olde booke belonginge to the parish churche of Cartmell, wee find that those persons here undernamed and others did pay to the use of the churche for every one of their buerials, who were bueried in Lord Harrington's Queare and the Organ Queare, as followeth: First, Mr. Samuel Knipe, sonne of Isaac Knipe, bueried in the Organ Queare, Anno 1613—6s. 8d. ; Mr. Timothy Knipe bueried in the same place in 1622—6s. 8d. 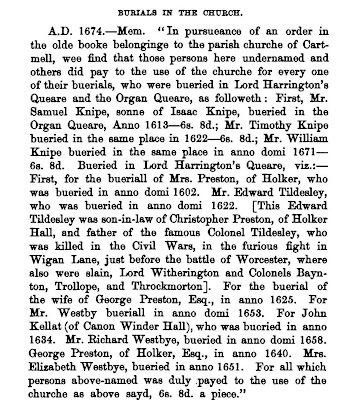 ; Mr. William Knipe bueried in the same place in anno domi 1671—6s. 8d. Bueried in Lord Harrington's Queare, viz. :—First, for the bueriall of Mrs. Preston, of Holker, who was bueried in anno domi 1602. Mr. Edward Tildesley, who was bueried in anno domi 1622. [This Edward Tildesley was son-in-law of Christopher Preston, of Holker Hall, and father of the famous Colonel Tildesley, who was killed in the Civil Wars, in the furious fight in Wigan Lane, just before the battle of Worcester, where also were slain, Lord Witherington and Colonels Baynton, Trollope, and Throckmorton]. For the buerial of the wife of George Preston, Esq., in anno 1625. For Mr. Westby bueriall in anno domi 1653. 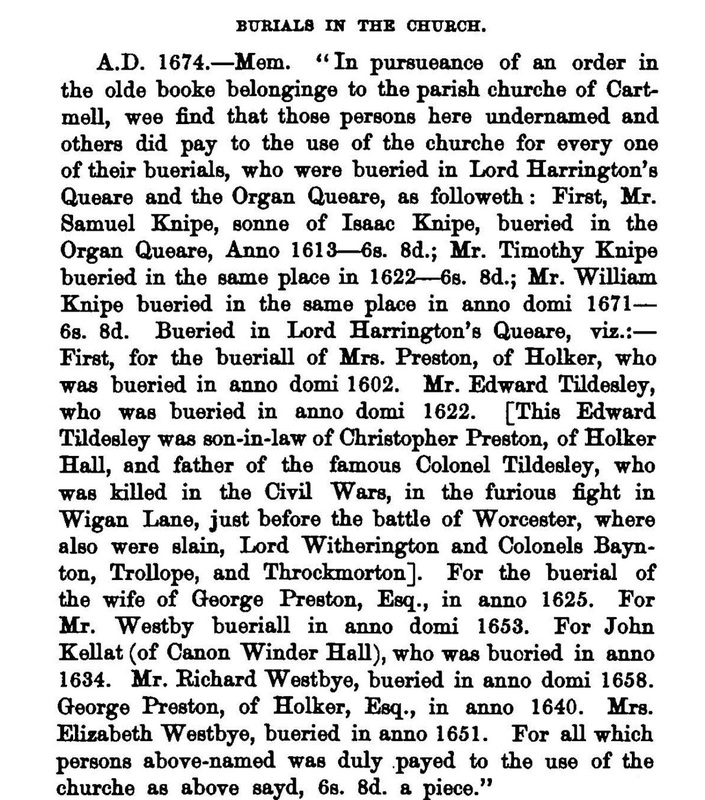 For John Kellat (of Canon Winder Hall), who was buoried in anno 1634. Mr. Bichard Westbye, bueried in anno domi 1658. George Preston, of Holker, Esq., in anno 1640. Mrs. Elizabeth Westbye, bueried in anno 1651. For all which persons above-named was duly payed to the use of the churche as above sayd, 6s. 8d. a piece."